Looking for a Valentine’s treat that’s as sweet as they are? 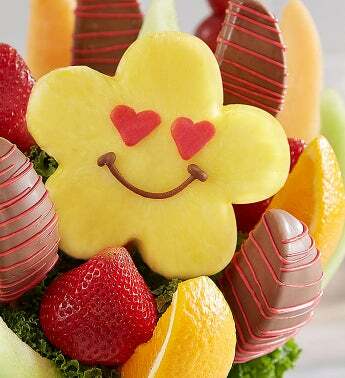 Our daisy-shaped pineapple slices are decorated with chocolaty heart eyes and smiles and arranged with a mix of decadently dipped apple wedges, juicy strawberries, mouthwatering melon, grapes and more. Whether for a friend, daughter, girlfriend, or mother – this bouquet is one sweet treat.